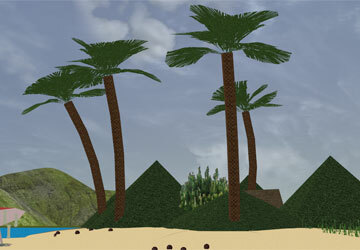 File Island is an island in the Palm Sea, located approximately 30 coordinates off the southern Palm Sea shoreline. This quaint, sunny island is a very popular attraction for tourists and vacationers due to it's soft, sandy beaches. Every year, an estimated 10,000 people come in and out of the island for one reason or another. File Island is commonly travelled to via charter flights in prop-planes from SW City International Airport which can be booked with SW Air. Planes usually dock on Server Island and people are escorted over to File Island via the foot bridge which connects the two. Palm Sea Ferry also services the island via Server Island docks. A fully modern subway station was also implemented on the island. The lower section of the station was constructed by digging into the seabed of the Palm Sea. A large dome was built over the hole then seawater was pumped out to create a large, empty space. Since then, much of the sea flora has grown back on the walls of the station. The island can be accessed by subway on the Estate Loop. Low laying hills follow the circumference of the island and encase the development from the sometimes harsh eastern winds. Extremely soft sand also circles the entire island, which is usually the reason for vacationers choosing this area as their destination. A man-made pond is situated in the center of the island. The pond was filled with crystal clear water which was shipped in from Rage Lake. The water was purified and de-colorized on Hyokia Island. Early settlements arose on File Island during the Imperial Era but were bulldozed to make way for most of the buildings you see there at the present day. 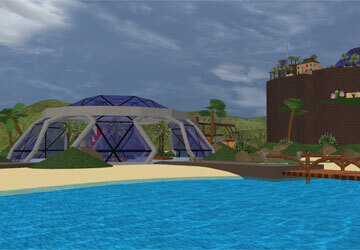 There are currently six buildings on the island.